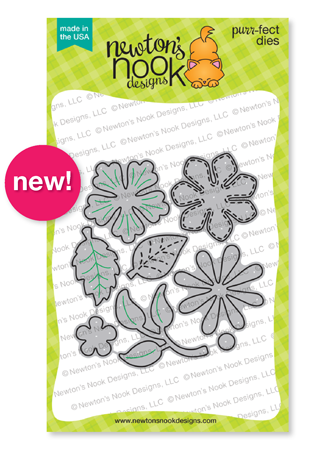 Newton's Nook Designs: February Reveals - Day 1 - Loads of Blooms Stamp Set + New Dies and Stencils! February Reveals - Day 1 - Loads of Blooms Stamp Set + New Dies and Stencils! This is our second post today! To see an adorable card by our Guest Designer, Jennifer Dove, scroll down or click here. Today is our first reveal day for our February Release! This month we have some awesome new spring products! 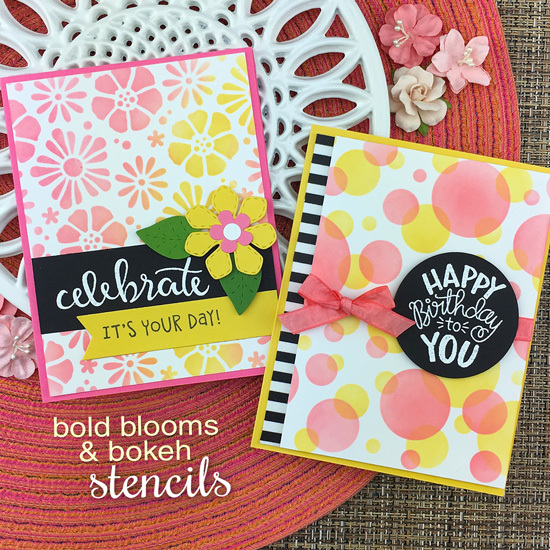 We're starting things out today with TWO new Stencils, Bold Blooms and a Bokeh two piece set. 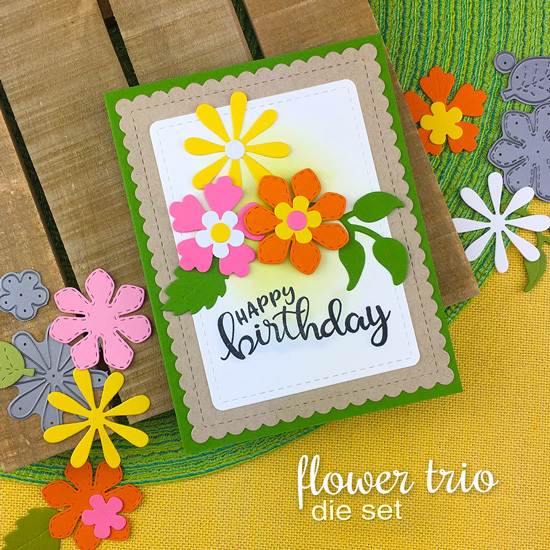 We also have the new Flower Trio Die Set and and fun new stamp set, Loads of Blooms! We are having a giveaway today too, so make sure you read all the way to the bottom of this post to see how to win! 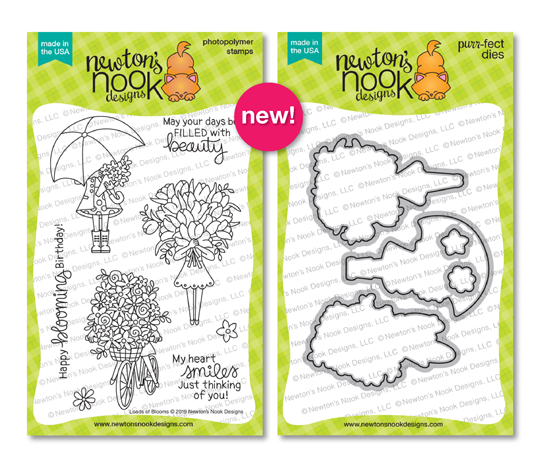 This lovely 4x6 stamp set is perfect for sending LOADS of fun! The trio of ladies in this set are laden with oversized items that are just right for Spring! The enormous bouquet of tulips, giant umbrella, and bicycle basket filled with florals are sure to brighten anyones day! Mix and match these three fun flower shapes for endless possibilities! This set includes three flower shapes that can be cut multiple times and layered with the smaller flower center and circle to create beautiful blooms. It also includes three types of leaves to layer with them to create fun bouquets. The dies also include extra stitching and embossed details. This layered stencil design makes creating bokeh backgrounds simple. Use one stencil for the first layer of circles, then add the second layer with a different color to achieve a quick and easy bokeh effect. Both stencils include etching of the opposite layer so they are easy to line up. 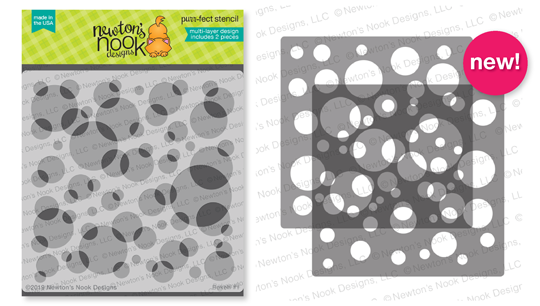 Or, for a fun simple circle backgrounds, the stencils can each be used on their own! Perfect for creating backgrounds any occasion. Single stencils include one 6 x 6 stencil and the stencil set includes two 6 x 6 stencils that can be combined to create a layered design. Get inspired with gorgeous spring florals by our Design Team! 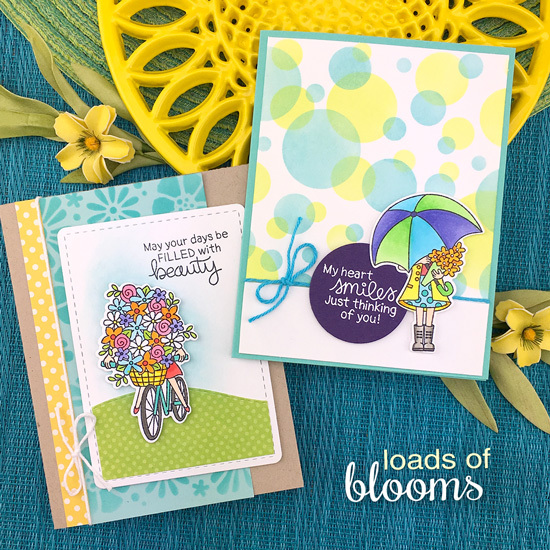 Maria created a lovely scene with the girl riding the bicycle from the new Loads of Blooms Stamp Set. 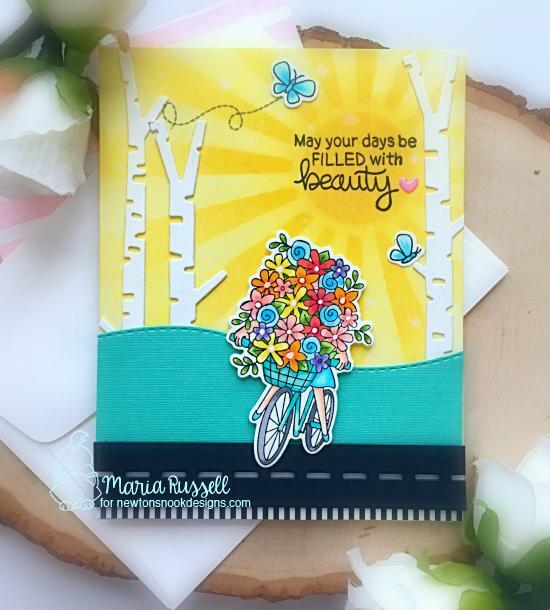 She added in elements to create a scene using the birch trees using our Forest Scene Builder Die Set, a hill using our Land Borders Die Set, and a sunny sky using our Sunscape Stencil. 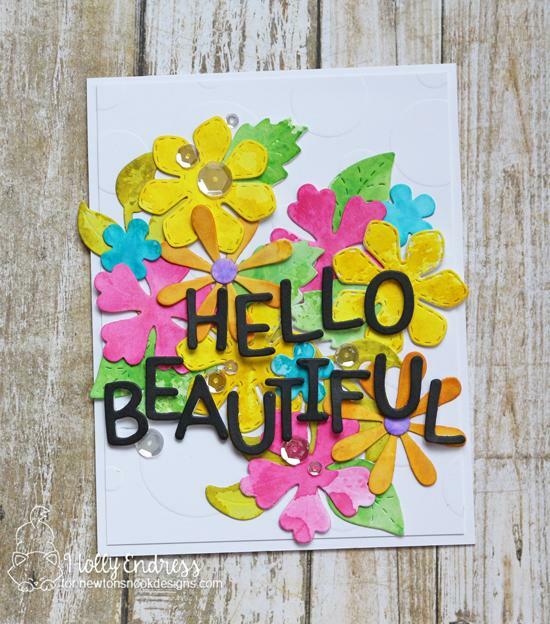 Larissa created this sweet floral card by cutting out the daisies from felt using our new Flower Trio Die Set! She also added words in the background from the new Loads of Blooms Stamp Set and added a scalloped edge around the whole thing using our Frames & Flags Die Set. 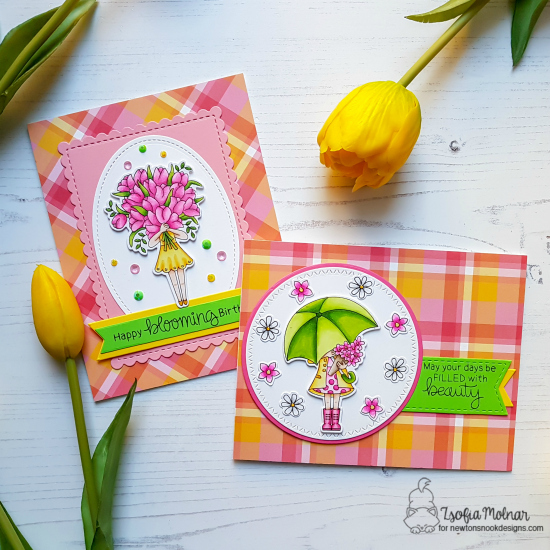 Zsofia created a fun duo of Spring cards using the ladies from our new Loads of Blooms Stamp Set. She colored them in bright pastels and then added them onto fun bright plaid card bases! She also used our Frames & Flags Die Set to cut out the banners. 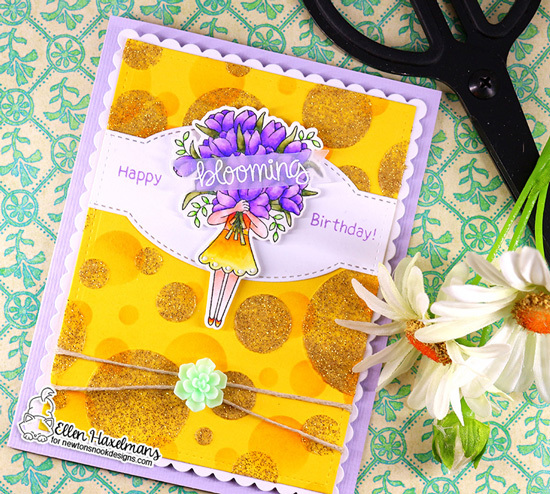 The spring colors on this card by Tatiana are so fun and vibrant! 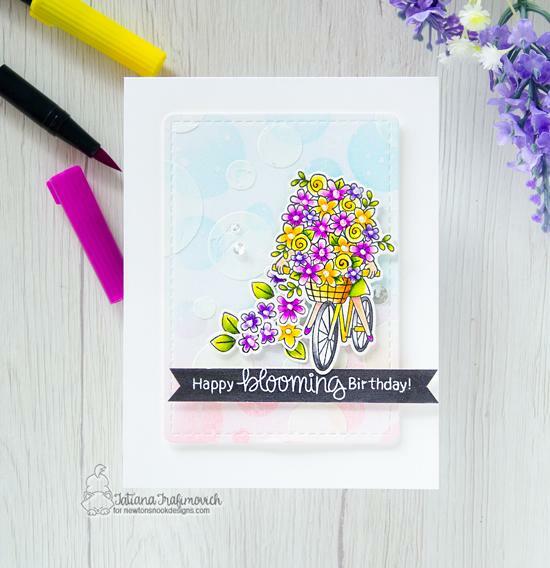 She used the lady riding the bicycle from our new Loads of Blooms Stamp Set and added her and some extra flowers to her card. For the card she cut out the stitched rectangle and banner using our Frames & Flags Die Set. She also added some fun circles to the background using our new Bokeh Stencil Set! 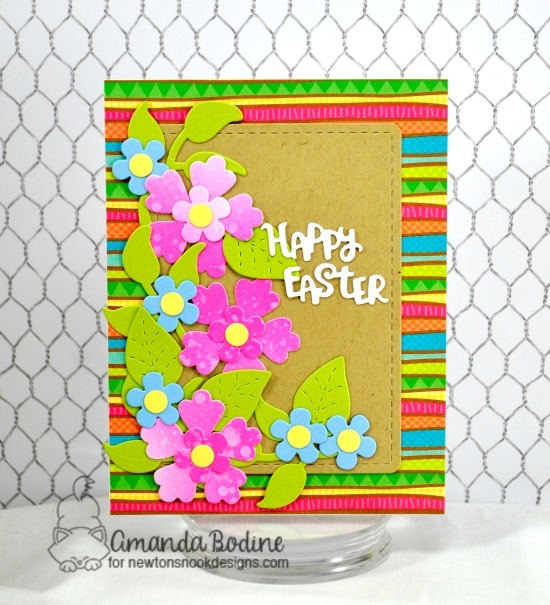 Amanda created this fun floral Easter card using our new Flower Trio Die Set to cut out pretty blooms from paper that had been dyed with distress inks! She added in bright green leaves and tiny blue blooms to create a fun card filled with flowers! She added in the kraft colored stitched panel, cut out using our Frames & Flags Die Set and the die cut "Happy Easter" is a sneak peek of a die that will be revealed later this week! 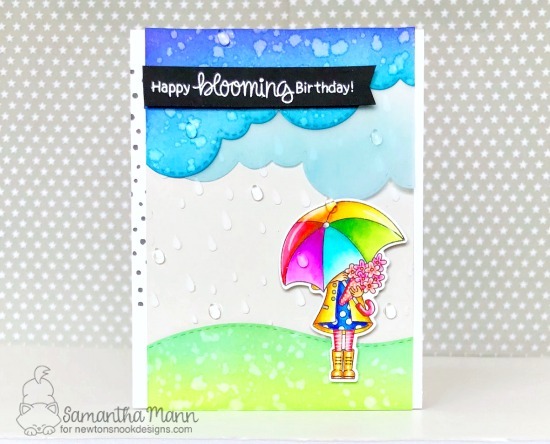 The fun bright spring colors continue on this vibrant spring card by Samantha! She used the lady holding the umbrella from our new Loads of Blooms Stamp Set and created a lovely scene for her adding in hills using our Land Borders Die Set and bright blue clouds using our Sky Borders Die Set! Perfect for a Spring Birthday! This Spring card by Andrea is full of fabulous florals! She created a floral pattern using our new Bold Blooms Stencil and then used it as a background for a fun shaker card. She created the shaker frame using die cuts from our Frames & Flags Die Set. Then she added the image of the lovely lady holding a huge bouquet of tulips from the Loads of Blooms Stamp Set in front! 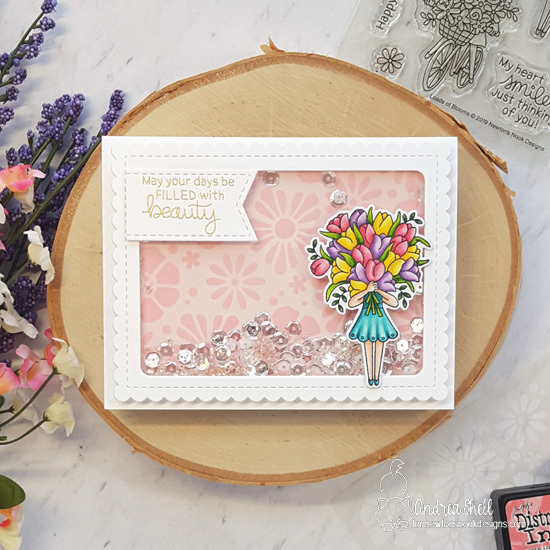 This gorgeous spring card by Holly is bursting with spring color and flowers! She created fun distress inked panels in bright colors and used our Flower Trio Die Set to cut out the flowers. She added in a custom sentiment using our Essential Alphabet Die Set. She also added subtle textured bubbles in the background by dry embossing with our new Bokeh Stencil Set. This card by Naki is so perfect for sending spring smiles! She used our new Bold Blooms Stencil with several ink colors to create a fun spring background. 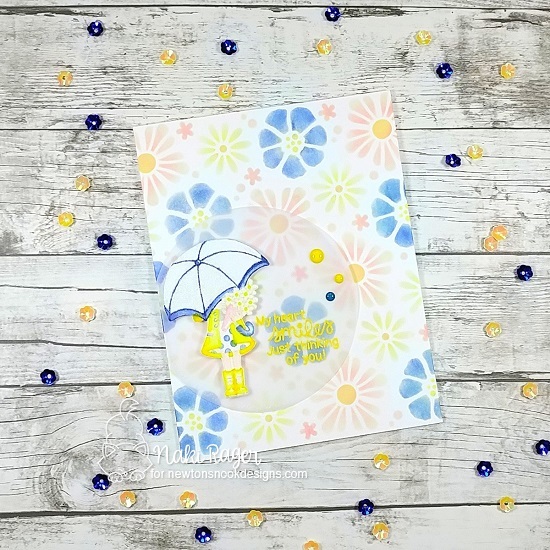 Then she stamped the image of the lady holding an umbrella from the Loads of Blooms Stamp Set and colored it in fun shades of yellow and blue to add to her card. She finished it out with the sentiment embossed on vellum! This lovely birthday card was created by Ellen. She colored the image of the lady holding a giant bouquet of tulips from our new Loads of Blooms Stamp Set. In the background she created big bubble in yellow and sparkly gold using our new Bokeh Stencil Set. She also used our Frames & Flags Die Set for the scalloped edge. I love all this gorgeous inspiration! Beautiful cards Jen, it's so exciting to see all these florals! Love the idea of no faces to color. Really cute. Such bright springy cards and pretty blooms! Wow! It's already Spring time with your new amazing release!!! Gorgeous cards!!! Love so much Loads of Blooms!!! Wow! Love all the fabulous new stuff! So many great ideas and sweet projects from Design Team! What a wonderful start of the week!!! Blooms stamp is fantastic. Can't wait to color some card with that. So cheerful. Wonderful new Spring products! I love all the bright and cheerful inspiration. Love these! Especially the Blooms stamp set and Bokeh stencil! Wowzers! Spring is definitely in the air!!! Love the huge bouquets! We used to get them that big at our local market for $15!! (Just 10 years ago, not last century even! lol!) I'd love to get a few bouquets and make a card with these to go with 'em! Kudos on the fab bokeh layering stencil, too!! oh these are nice new products! amazing inspiration projects from team! What fabulous stamps and dies especially during this icy weather here on the NE coast. Love the new stencils too. Lots of cute and cheery projects can be made with these new products. This is crazy, way too much cuteness, very excited about this release. Can't wait to hop, hop and hop to see everyones creations. Love the new sets, stencils and dies! I want it all! it was a wonderful hop. The bike full of flowers looks really cute! I love the flower stencil! Great projects and cards by the DTs as usual!!! LOVE This COMPANY!!! Great stamps and dies. I especially like the flower trio set. This is a beautiful set!! The cards are all amazing. My favorite is the bokeh stencil set, must have. Sweet stamp set, and awesome dies and stencils! Love all of these samples! Sweet stamp and die sets. Soooo PRETTY!!!! I love this release and the lovely cards! Beautiful release. Love the flowers and stamp set ready for spring. Wonderful projects that showcase the new products. Off to hop. Aw I love these. Your sentiments are always so good. These flowers remind me bunches you see in a Flower market!!!! So fun and creative! I love this really cute Spring release! Especially Excited about the new stencils! Such beautiful cards!! Yes Please!! I am loving the fresh spring inspiration! Needing something fun to take my mind off the fact we're buried in snow!!! These cards are great, the colors and stamps and dies make Spring that much closer! Love the stencils, they will be so much fun to work. They will work with all types of stamps. This set is so pretty, and I love all of the flower options. the bokeh stencils and the loads of blooms stamps will be living at my house as soon as possible. Fabulous. 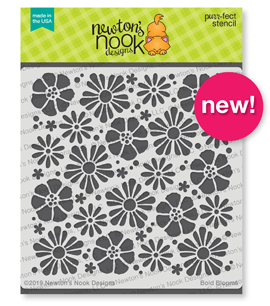 Love loads of Blooms and the new stencils!